Posted January 18, 2019 by Seán Kinane & filed under Elections, News and Public Affairs. In March, Tampa voters will not only vote for a new mayor, but all seven city council seats are in play as well. 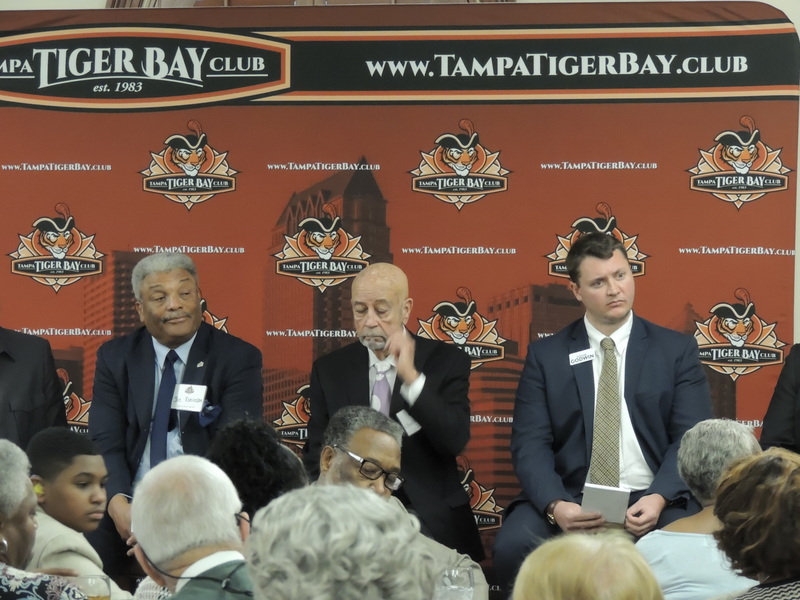 On Friday at the Tampa Tiger Bay Club, candidates from three of the city council races answered questions from club members. Two people are challenging Council member Charlie Miranda for the District 2 seat he holds. And the three shared their ideas for solving Tampa’s future needs for drinking water. “The first thing I would do is get with the Public Works director and find out how we could take 80 million gallons of water being dumped in (Tampa) Bay and make it a profitable, money-making venture for the City of Tampa. We’re dumping 80 million gallons of the Howard Curren (wastewater treatment plant) into the Bay. “Charlie, with all due respect, you’ve been with Council, off and on, since 1974. And you’re the longest-serving member of the water board. You haven’t solved it in those decades. I don’t know why we’d expect something different now. Candidates for Districts 1 and 5 also participated in the forum.